Tropical Storm Gordon made landfall on the Gulf Coast just after 10 p.m. local time with states of emergency already in effect in Mississippi, Louisiana and parts of Alabama. The storm was bringing gusty winds, heavy rain and potential flooding by the time it made landfall just west of the Mississippi and Alabama border Tuesday night with sustained winds of 70 mph. The storm had weakened significantly by 1 a.m. local time, with winds falling to 50 mph as it moved over land. However, the bad news is the storm is slowing down and likely to dump over a foot of rain inland. The storm also turned deadly late Tuesday when a child was killed as tree fell on a mobile home in Pensacola, Florida, at about 8:50 p.m., according to the Escambia County Sheriff's Office. About 24,000 customers were without power across Alabama, Florida and Mississippi -- the majority of those in Alabama -- as the storm made landfall. 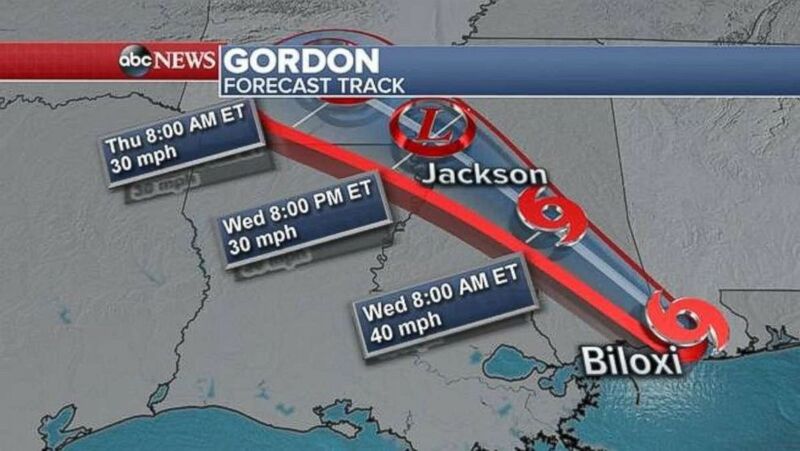 Gordon will bring heavy rain and possible flooding to inland Mississippi, Alabama and Arkansas. Hurricane warnings remain in effect for coastal Mississippi and Alabama. Heavy rain and inland flooding are major concerns for Mississippi, Alabama, Louisiana and Arkansas as the storm moves north over the next two days. Some areas may see up to a foot of rain -- especially near the Gulf Coast of Mississippi, Alabama and Florida, as well as inland parts of Mississippi. 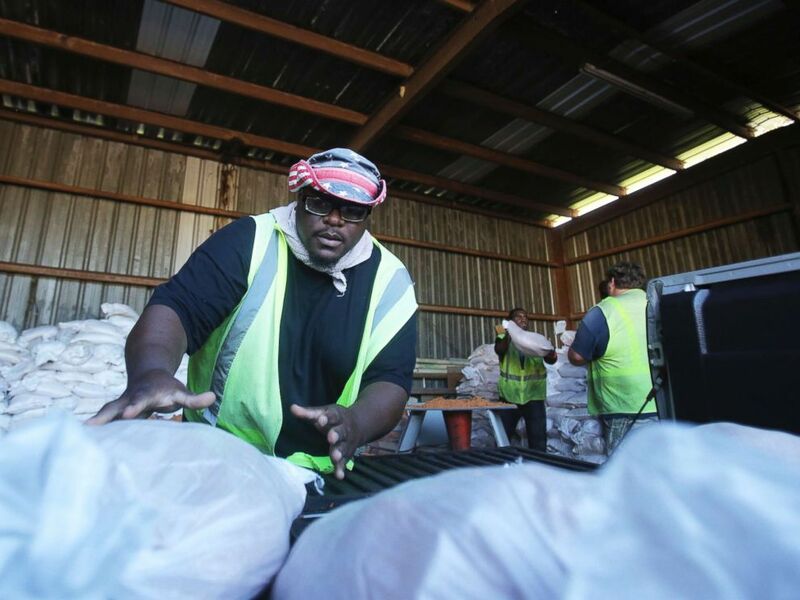 Marquis Chaney, with the City of Saraland, loads a truck up with sand bags to help residents prepare for Tropical Storm Gordon, Sept. 4, 2018, in Saralad, Ala.
A family watches the first rains clouds from Tropical Storm Gordon roll in, Sept. 4, 2018, in Dauphin Island, Ala.
Storm surge is also a concern, potentially reaching as high as 5 feet. "Nobody should panic but everybody should take this seriously," Louisiana Gov. John Bel Edwards said at a news conference Monday. The Louisiana National Guard has activated approximately 200 soldiers and airmen, with an additional 150 guardsmen authorized to assist. The Alabama National Guard also has guardsmen on standby and ready to respond if needed. "Approximately 50 Mississippi National Guardsmen are along the Gulf Coast in preparation for possible support in response to Tropical Storm Gordon," the Mississippi National Guard said. Once her Mississippi home was secure, Lisa Taranto-Merten brought her children to help fill sandbags for others in the community on Tuesday. "We all kind of jumped in and helped each other," she told ABC News. The storm has prompted casinos to close in Mississippi. 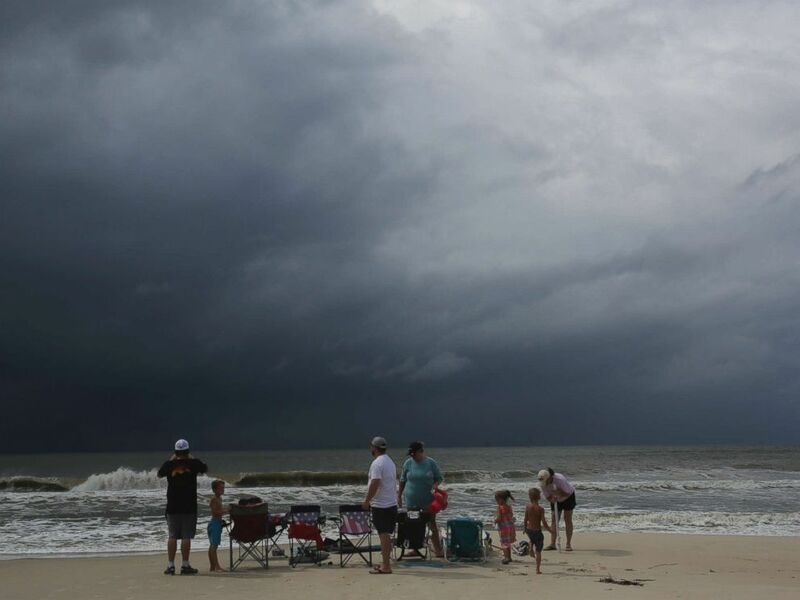 "Gordon is a tight, fast-moving tropical storm," Alabama Emergency Management Agency Director Brian Hastings said in a statement Tuesday. "If you live in the coastal counties, especially in surge and flood prone areas, it is imperative that you get to a safe place by early afternoon and stay there through Wednesday morning." Later this week, the remnants of Gordon is forecast merge with a cold front in the Midwest, bringing more rain and potentially more flooding to Arkansas and Missouri.